Ground source heat pumps take solar energy which has been stored underground and use it to heat your home and provide domestic hot water. Ground source heat pumps merely move the heat energy from one place to another rather than produce it by burning fossil fuels. Consequently, they are far more efficient than most other types of domestic heating system. Although ground source heat pumps need electricity to work they can convert one kilowatt of electricity into over three kilowatts of heat. This makes ground source heat pumps over 300% efficient. Ground source heat pumps are very reliable at providing heat all around the year because the temperature more than a metre below ground remains at around 10º centigrade, even during the winter. In April 2014 the Domestic Renewable Heat Incentive (Domestic RHI) scheme was introduced by the Government and it rewards householders for switching to renewable source of energy. Ground source heat pumps which provide heating to domestic properties using a wet central heating system such as central heating radiators will attract a Domestic RHI tariff of 18.8 pence per kilowatt hour of renewable heat energy they generate. For a typical four bedroom house with an annual heat demand of 20,000 kilowatt hours per year, the Domestic RHI tariff payment would be £3,760 per year. Domestic RHI tariffs are paid for seven years which means that if you install a ground source heat pump, the total Domestic RHI tariff you can claim would be £26,320. In addition to this, the Energy Saving Trust estimates that for a typical four bedroom property, a householder would save around £2,000 per year in heating bills by switching from LPG to a ground source heat pump. Taking Domestic RHI receipts together with savings in heating bills, the total benefit to a householder in this example would be £40,320 over the seven year claim period of the Domestic Renewable Heat Incentive scheme. The Domestic RHI scheme is open to owner-occupiers, private landlords, social housing, third-party owners of a domestic heating system and individuals building their own new self-build properties. However, because of the high cost of heating oil, LPG, solid fuel and electric storage heaters, householders who are off the mains gas grid will benefit the most from the Domestic RHI scheme. 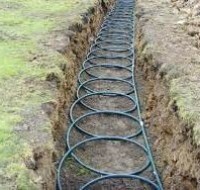 A series of pipes known as a ground loop is installed underground in your garden. The ground loop pipes contain fluid which absorbs heat from the ground surrounding it and the longer the ground loop, the more heat energy will be extracted from underground. Ground loops are installed in trenches just over a metre deep where the temperature of the ground remains at between 8º and 13 º centigrade throughout the year. Fluid from the ground loop is pumped up and into your home where, using a compressor and heat exchanger, the heat from the fluid is used to heat your home and provide domestic hot water. When installing a ground source haeat pump, the ideal set up for a domestic property would be to use the heat pump to provide heating for your home and a solar thermal water heating system mounted on yur roof to provide domestic hot water. The Domestic RHI scheme does allow you to make separate claims for RHI tariffs for each of these renewable energy heating systems. A ground source heat pump capable of providing the annual heat demand of a typical four bedroom house should cost between £9,000 and £16,000 depending on the size of the system and how difficult it proves to install the ground loop. Lower heating bills if you switch from LPG, heating oil, coal or electric storage heaters. Lower carbon dioxide emissions than LPG and coal. Domestic RHI tariff payments for seven years of 18.8 pence per kilowatt hour of renewable heat energy generated. Planning permission not required unless you live in a listed building or in a conservation area.